Last night, Penny Watson and I had a long talk about cultivating our personal ecosystems — a term I stole from author Susan K. Quinn. We decided we liked the word far better than community, partly because Penny is a gardener, but mostly because there is a very subtle but important difference between the two. In ecology, a community is a group of various species that live and interact with each other. The same could be said for human communities. This page, for example, is a group of people of all different shapes, sizes and colors spending time together. Writers groups, sewing clubs, the houses on the cul-de-sac – these are all communities. They are needed and welcome because we are social creatures. An ecosystem, however, is far more complex. An ecosystem is what sustains us. The contents of our human ecosystem contribute to our moods, our health and our over-all well being. Not everything in our community feeds us. In fact, sometimes there are parts of our community that are downright destructive even as we share commonalities. American Beauty Roses and Multiflora Roses, for example, cannot thrive longterm in the same garden community. Eventually the multiflora roses will choke the life out of the American Beauty. Penny and I decided we don’t want multiflora roses in our gardens. We want to build gardens that grow the biggest, best American Beauties you’ve ever seen. 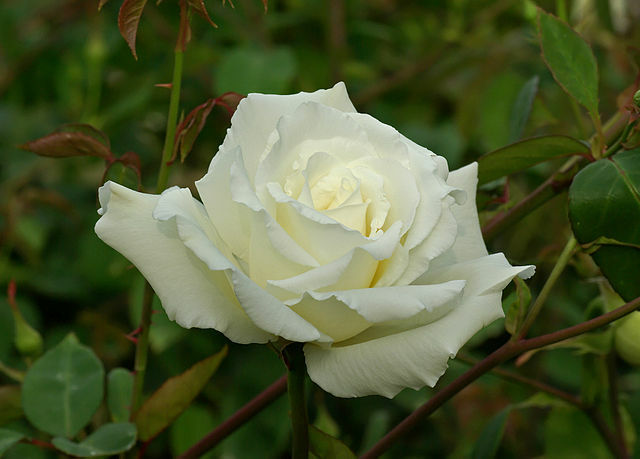 That means surrounding our roses with flora and fauna that boost our roses’ growth. Sunshine, plant food and lots and lots of pretty bees and butterflies. As earthy crunchy as this all sounds, it bears thinking about. How many of us hang out with people (or follow them on social media) simply because they are part of our community? Do we really need those connections? At the same time, do we really need to read all the negative news stories in this world? To continue to filling our souls with the same dark and angry thoughts over and over? What makes your garden thrive? What sustains you? Add those items to your ecosystem? And weed out the rest.